Are you thinking about how to get a divorce? Mediation is a process that avoids the costly and lengthy process of filing for divorce and fighting it out in the courts. Read our frequently asked questions to find out more about our specialist family mediation services in Perth. If you’re wondering how to file for divorce, mediation may be a better solution for you. Mediation is a process where an independent and impartial third person helps to find an agreed outcome between you and the person with whom you are in disagreement. The mediator’s role is to help you compromise your differences and arrive at a negotiated agreement which settles your dispute(s). This avoids the necessity of taking matters to Court. 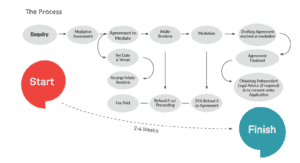 What are the steps in the mediation process? Firstly, we deal with your enquiries about the process, costs and timing. Then, we discuss the possibilities with the other person and seek their agreement to proceed with mediation. If both of you agree to mediate we set a date, agree the venue and provide you a formal Agreement to Mediate and an invoice. When the Agreement is signed and returned with the fee payment by both of you, we make arrangements for a confidential telephone discussion with each person to discuss issues and desired outcomes (the intake sessions)..
We then hold the mediation and work towards agreement on all issues raised by you both. as the basis for further discussions and negotiations. Why do we have an intake session and what can I expect during this discussion? The intake discussions will take place with each of you by telephone a couple of days before the mediation itself. We want you to ask whatever questions you may have about the mediation process, how it works and what to expect. During these discussions – which are entirely confidential and the matters discussed will not be disclosed to the other – we explore what are the issues that you both want to explore at mediation and how you want them to be resolved. We want to know what your ideal result would be. These telephone discussions will take as long as is required to answer any questions you may have – so there are no surprises at the mediation. What do I have to do to prepare for the mediation session? We will explain at the intake sessions exactly what is required for the mediation. In financial/property matters we will ask you to prepare a spreadsheet or a list of all of the assets (including superannuation) and liabilities and valuations. That may include copies of recent bank and credit card statements, appraisals of real estate and superannuation statements. In children’s matters it is likely that both of you will be requested to provide an outline of the specific proposals you are seeking for arrangements for the kids, who they are to live with, how and when changeovers are to occur, holiday arrangements and the like. What happens when we reach an agreement at mediation? to obtain legal advice, where desired. Can I use the agreement reached at mediation as Orders to be made by the Family Court? The Family Law requires agreements (whether about financial separation or arrangements for children) to be formally approved by the Family Court. There is a formal process to achieve that, which includes filing an Application in the Family Court (called a Form 11 Application for Consent Orders. A filing fee is payable (currently $160.00). We will draft the agreement reached at mediation in a form which would enable you to use it as the orders you are asking the Family Court to make about financial or children’s matters. That way, you can obtain a binding and enforceable agreement. You are both entitled to obtain independent family law advice about the terms of an agreement before it is filed in the Family Court. However, independent legal advice is not a formal requirement and you can make up your own mind whether to instruct lawyers or not. Is it compulsory to attend mediation before I commence an application in the Family Court? Yes – if the matter involves children you must have a certificate issued by an Accredited Family Dispute Resolution Practitioner before commencing proceedings in the Family Court (except in some exceptional circumstances, such as where there is family violence). In matters involving finance and property, it is not a legal requirement to participate in mediation before commencing proceedings. However, the Family Law Rules do require that you make a genuine attempt to resolve matters before bringing the matter to the Family Court; prior mediation satisfies that requirement. In any event, mediation is often ordered by the Court if it has not already taken place. What if we don't agree? Most mediations achieve resolution of at least a majority of the issues. If you cannot resolve your differences at family mediation, you have spent a very limited amount of time and a little money to learn that you will now have to spend lots of time and money to go to Court. Both of you will be engaging the Court process in the knowledge that you are unable to resolve your disputes and need a third party to make those decisions for you. In some mediations, not all issues are resolved at the first session. However, the groundwork for full agreement has probably been established and further work may achieve a satisfactory agreement. At very worst, many of the issues which were previously contested will not have to be argued in the Family Court because they have already been resolved. What happens if we do agree? Why should I mediate instead of going to the Family Court? To allow you to move on with your life. What is different about Move On Mediation and why should I use Move On Mediation instead of another mediation firm? Move On Mediation is totally independent. Move On is managed by a family lawyer who is not working in or associated with any law firm. We have no hidden agendas – our transparency is your assurance that we are seeking positive outcomes and results. We give fixed fee quotes, no hourly rates, because we are interested in achieving results, not being paid for our time. Ian Shann was personally involved in family law proceedings and has practiced as a family lawyer for over 25 years, being an Accredited Family Law Specialist for most of this time. He has enormous experience in this field. Ian has been mediating for almost 10 years and has achieved a success rate of around 90% in getting matters resolved..
Move On uses a solution focus process at mediation – which has been developed to assist you to concentrate on the future and work towards positive solutions. It avoids dwelling on the problems of the past and emphasizes the positives of moving on. Ian Shann brings all this experience and his knowledge of the family law to each family and divorce mediation to assist parties to find their own solutions and help them Move On with their lives. If the other party has not agreed to mediate, how do I get to mediation? Where you wish to mediate and the other person has not agreed we will, without cost or commitment, contact them and discuss the possibility of mediation. In most cases, we are able to encourage the other person to participate in a family mediation in an endeavor to resolve issues. However, where they are still unwilling to mediate in children’s matters we may issue a certificate to enable you to commence proceedings in the Family Court. In matters involving property/financial settlement, where the other person refuses to mediate, you may have to commence proceedings in Court. You may be ordered by the Court to then undertake a form of mediation known as Mediation Style Conferencing. Does Move On Mediation provide legal advice about the family law? We are permitted to provide general legal advice about the family law if requested to do so by both of you and in the presence of both. the legal processes to obtain consent orders and why it may be important for you to put consent orders in place. Independent legal advice is everyone’s right. However, you may seek to resolve your family law issues without legal involvement if you so desire. Legal advice is necessary if you wish to enter into a Financial Agreement (quite different to Consent Orders) or a Binding Child Support Agreement. We can advise what each of these Agreements mean, but we would not provide a certificate of independent legal advice as required by law. What does it mean to have a legally binding and enforceable agreement? A legally binding and enforceable agreement is one that has been approved by the Family Court. This agreement may cover financial issues or matters involving children and, once approved by the Family Court. The exception to this is where you are seeking a Binding Financial Agreement or Binding Child Support Agreement – which are used in limited circumstances. How do I make an agreement reached at mediation legally binding? The family law requires that all agreements regarding property settlement and/or children’s matters be formally approved by the Family Court. The agreement reached by you at family mediation becomes legally binding and can be enforced by both of you when approved by the Family Court. You must follow a formal procedure to obtain the Court’s approval to Consent Orders and Move ON will help you through that process by providing a written guide setting out the steps to follow. Can I bring my lawyer or a support person to mediation? Yes. No problems, provided both of you agree it’s OK to have lawyers (or anyone else) there to support and/or assist you. If you have someone for emotional support they will not be able to participate in the divorce mediation but can sit with you throughout the process. Do I need to get legal advice about the terms of any agreement reached at mediation? Is it in my best interests? No. There is no law requiring you to get your own independent legal advice about the terms of your agreement before submitting it to the Family Court for approval. You are entitled to make any agreement you wish provided it is a fair and equitable property distribution and/or in the best interests of children. However, you may wish to obtain independent legal advice to satisfy yourself that the terms of any agreement are legally appropriate. In such a case we would recommend you consult a lawyer who specialises in family law advice. In a small number of cases you may require the finalization of a Binding Financial Agreement or a Binding Child Support Agreement – the family law says that you must have certified legal advice in these circumstances. Am I entitled to instruct a lawyer to settle a matter, irrespective of their advice to me? It is you who are instructing the lawyer and, irrespective of his/her advice, you can instruct him/her to proceed with your application for consent orders. If a lawyer advises you not to formalize an agreement reached at mediation you should always ask them to provide that advice in writing, stating clearly why the terms of the agreement might be inappropriate or outside a reasonable range of settlement. The lawyer’s advice should also include their views as to what is a reasonable range and the reasons for coming to that conclusion. In children’s matters, a legal advice should canvas the reasons why proposed arrangements are (or are not) in a child’s best interests. If you proceed to Court on the basis of the lawyer’s written advice (and incur significant legal fees in doing so), you have the comfort that the lawyer has committed their advice (and its consequences) to writing and you have evidence in case the advice turns out to be incorrect. Lawyers should always be required to explain their advice as it is the client who bears the consequences if the advice is wrong. What qualifications do mediators have? And Ian Shann? There is a national scheme for accrediting mediators and a set of standards that mediators must maintain. [This is called the National Mediators Accreditation Scheme (NMAS) and is overseen by the Mediators’ Standards Board (MSB)]. The conduct required of mediators is supervised by the Mediation Standards Board and set out in the National Mediators Accreditation Scheme’s “Mediator’s Standards”. Among other things, these standards require mediators to be of good character, undertake appropriate training and maintain ongoing quality control and skills updates. Ian Shann has been a NMAS Accredited Mediator since its inception. Initially (in 2008) he was accredited through LEADR (now the Resolution Institute) and since 2013 has been accredited through AIFLAM (the Australian Institute of Family Law Mediators and Arbitrators). Any complaints about Ian’s work as a mediator may be referred to the dispute resolution processes of AIFLAM or the Resolution Institute. Ian is also an Accredited Family Dispute Resolution Practitioner (No: R1004896) under the Family Law (Family Dispute Resolution Practitioners) Regulations 2008. He is a registered practicing lawyer of the Supreme Court of Western Australia but is not associated with any legal firm or business. Ian is a member of the Family Law Section of the Law Council of Australia, the Family Law Practitioners’ Association of WA, AIFLAM and the Resolution Institute. He is also an accredited arbitrator under the Family Law Act 1975 (Cwth) and the Family Court Act 1997 (WA). Does the mediator have an interest in the outcome of mediation? Mediators are neutral and must not have any association with persons involved in family separation mediation that might affect their impartiality. Mediators must disclose any possible conflicts or interests which might influence them from being entirely fair and unbiased; for instance, if they have a previous association with either of the parties or have a financial interest in any of the issues between them. What if I am concerned that I will not be fairly heard or that I will be intimidated or threatened by the other person? It is the mediator’s responsibility to ensure that all persons are given a fair opportunity to express themselves in mediation and to protect them from intimidation or threats. If the mediator believes that you are not being given fair opportunity or that the other party is abusive, threatening or intimidating, it is likely that the mediation will be terminated. If you have concerns about your safety at the mediation, arrangements can be made to have you in separate rooms and for the mediator to go between you so that you do not have physical contact with the other person. This issue would be discussed during the intake sessions and arrangements put in place prior to the mediation. Are the things we discuss at mediation confidential? Everything discussed at divorce mediation is confidential. If matters are not resolved, what you have said or offered may not be used against you in later Court proceedings. Similarly, you will not be able to raise later any offers or proposals that you made at mediation. Neither the mediator nor the persons involved may disclose what has been discussed to others or use it in Court. This encourages you to put it all on the table in an effort to resolve issues; unlike Court proceedings which are entirely adversarial and what is said by either person can be used against them in those proceedings. The only exception to confidentiality is where there is an admission of child abuse; in this case a mediator has an obligation to report their concerns to the appropriate authorities.